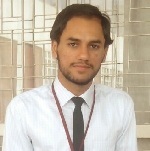 Moazzam is invaluable to the firm, because of his discipline and timeliness. Money matters are managed and dealt with effectively. He completed his Bachelor’s degree in Accountancy in 2010 and has been working in AAA since then.